Fixtures that attach to the wall are known either as wall lights, sconces, or vanities. Vanities tend to be installed in the bathroom, particularly alongside a mirror. It can be hard to sort through all the different wall lighting fixtures, but here are a few tips. Wall Sconces can be attached to the wall of almost any room. Wall Sconces Lighting can be particularly useful when the ceiling is very high in a room. Sconce lighting are seen on the sides of a mirror, next to a fireplace, or up the sides of a stairwell. Wall Sconces can provide task, accent, or general lighting. Wall sconce lighting should be hung at least 5' from the floor. In hallways, sconces should be between 8' and 10' apart. In stairways, consider a 3-way switch for upstairs and downstairs. Buy sconces and other fixtures from the same lighting collection, for a unified look. Designing a lighting plan for your bathroom can be tricky. Utilize different types of lighting fixtures for a layered lighting effect. Place bathroom vanity lighting on the sides of the mirror as this ideal cross-illumination eliminates shadows under your eyes and chin. They should be mounted about 5' off of the ground and about 36 - 40" apart, if you have the space for it. If you can't put vanities on the sides of your mirror, put a vanity light bar on top of the mirror. It should be about 75 - 80" above the floor. 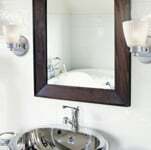 If you are able to, combine side vanities and top vanity wall lighting for a better layered lighting effect. For dual-sink setups, the mirror should be a little bit wider than the over mirror light bar. We recommend at least 150 watts of light (incandescent) for the vanity. Consider a dimmer if you are worried about too much light. It is always easier to reduce wattage than increase it on a fixture already installed. Layers of light are more effective than one big central light because you can better control the light, depending on the task at hand. To prevent glare and light objects evenly in the room, use multiple sources of light, such as close to the ceiling lights, recessed lighting, cabinet lighting, & wall lighting fixtures. Even layers makes it easier to shave or apply makeup in the morning. This effect is created by the perfect amount of wall lighting fixtures and ceiling lighting. Ceiling mounted lighting can still provide ambient lighting that won't glare off of chrome or tile. Mirrors: Mirrors can make a room look larger, and increase the impact of anything they reflect. Chandeliers: Chandeliers with glass and crystal can multiply and fracture light, creating depth as a central source of lighting. 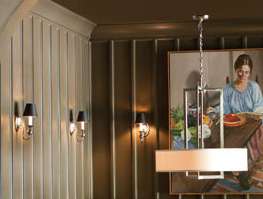 Flush Mount: With dimmers, a flush mount light is always a good idea. Sconces: Alongside mirrors or above the mirror, sconces are available in many sizes from one light to five or more. Pendants: Pendants above a bathtub or alongside the mirror is a contemporary option for lighting.